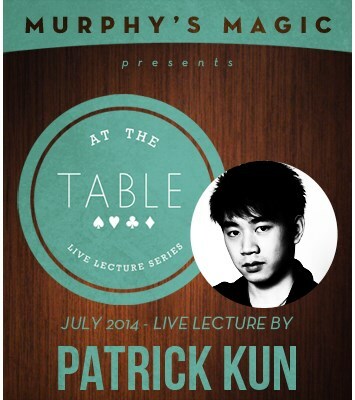 For this lecture, Patrick Kun wants to discuss about impromptu visual magic and how he develop most of my magic using visual gimmick effects as guidelines. Patrick would like to open the lecture performing his 4 card change, MORF. This will be performance ONLY as it is visual and will grab their attention right away. It's one of his pet effects on his DVD Patrified. Patrick will start by attempting to produce four Aces from the blue deck and failed to produce 4 Eight's instead, giving an excuse that they sounds similar to ace anyway and it should count. Then he will visually change them into Aces. With a twist, he pretends to explain to them that he was actually cheating and used marked cards. As he turned over the back of those Aces, they now changed into 4 red backs with "MARKED" written on and when spreading the deck face down, the rest of the deck is also changed. - Inflict (Patrified) / Sandwich Plot: This is a visual color changing sandwich routine that can be done with many different presentation. - PK Collector / Collector Plot: Selection found between a four of a kind with in a split second. - DIY Aces (Patrified) / Gambling Plot: Simplify version on the Spectator Cut Aces plot. Very straight forward and easy to do. - VOW (Basic Version) / Anniversary Plot: A basic version of my upcoming release called VOW. This is a basic version that can be done with any double facer. Very simply and direct version of Anniversary Waltz plot. - Surge / Impromptu Card Rise: Impromptu card rise that can be done with any card box. No gimmick or anything added. Everything is completely examinable. Can also be done with a color change as well.